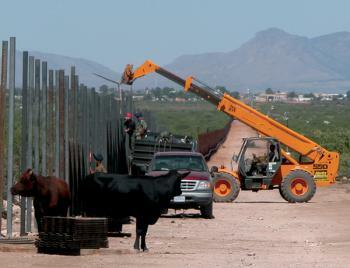 Volunteers with hard hats work equipment in building the California-Arizona border fence. In response to the State of Arizona’s new immigration law, California volunteers have begun construction of a new border fence along the Colorado River. Out here near Yuma and along the River, the winds have started to pick up. Dozens of volunteers are swarming the construction site and border fence panels and wiring are being strung up rapidly. People are working at a feverish pitch – no doubt motivated by the recent immigration crisis in Arizona. Just behind the fence, on the California side, structures are being raised that will house the border officials who will be checking the documentation of drivers of vehicles with Arizona license plates. That’s right – only cars, SUVs and trucks with the telltale plates will be required to stop. Drivers will then be asked to produce genuine US Social Security cards before proceeding into California. They’ll also be able to get in with proof that they did not vote for the current Arizona governor Jan Brewer. Arizona border fence organizers I just spoke with are hoping the fence will be up along a 100 mile line from the border with Mexico all the way along the Colorado River in the next three weeks. This will be just in time for when residents of Arizona begin their annual trek into the cooler climes of California. That’s all I have to report – stayed tuned to this media for more updates. This was the most recent report from the border. We’ll have more in the near future as this project gets underway and closer to its completion. Volunteers are being used for the construction because when the call went out for firms to compete for the project, so many people showed up willing to do the work for free, and with local unions in agreement, it was decided to proceed with the volunteers. Material for the fence and equipment were all donated by local farmworker associations, the Mexican government, and by just plain California citizens and businesses. 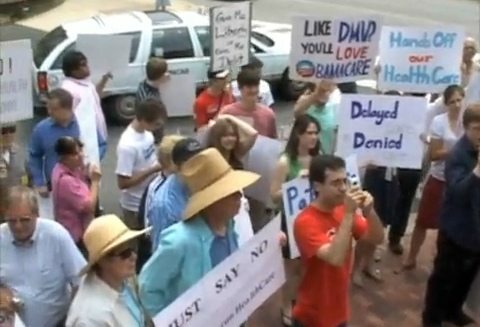 In a related matter, crowds gathered around the local San Diego offices of Representative Duncan Hunter, chanting, “Where is your birth certificate! Show us now!”, apparently in response to his recent speech to a Ramona Tea Party rally where he claimed that the souls of his shoes proved he was an American citizen. However, recent evidence has surfaced that indicates he actually may be a replicant, modeled after another Duncan Hunter who was in Congress for years. More on this story later. And a short for Certificate of Live Birth won’t cut it, they need the long form. Funny april fools. You fools. At least San Diego is one of the few border towns with a real fence thanks to Duncan D Hunters dad, Duncan Hunter. Who fought to actually protect San Diego from the problems which transferred San Diego drug war/human smuggling problem to areas with out fences. Like East County, where I grew up! the only thing either Duncan Hunter ever fought for was more pork at the trough; i have to say the American flag they wrap it in makes it all very special. Fenceremos! Here’s to a Zonie Free Zone. Thanx Frank. i am going to keep believing this until someone tells me otherwise. maybe those of you who eat hamburgers will be able to get a Hodads burger now without waiting in line. Where do I sign up? I’ll volunteer to build the fence! That may have been mildly amusing if Brewer was ever even on a ballot to be voted in as Governor. Hint: She wasn’t. She inherited the position because AZ does not have a Lt. Gov., and, when Janet Napolitano left for her federal post, the Gov. position became vacant. Next in line in AZ after Gov. is Secretary of State, which was the position held by Brewer. Not a big deal, but still, do a little fact checking before cracking dumb jokes. Peyton – thanks for the clarification / correction. I didn’t think it was dumb, I mean, how many times do you get a chance to make a joke like that. Not often, I tell you. Let’s see … hmm, I need to think of another punchline. Any takers? how about we skip the whole proof thing and just keep the border with arizona sealed? Can I be allowed to stay here? I mean… I did grow up in Arizona, but I swear I’ve been a legal, West of Five resident for a long time and I only went back for one funereal and one reunion. Please don’t send me back! I claim refugee status! can i see documentation that proves what youre saying? The irony, of your yes humorous joke, is that the state does stop cars on I8 as they enter the state and asks motorists “where they are coming from”. So how intrusive is that? Cat, not only was I stopped two weeks ago, but the arrogant, ten-gallon-hat-wearing, Border Patrol agent (of Mexican descent no less) asked me to pop my trunk, and when HE COULDN’T FIGURE OUT HOW TO OPEN IT, he pulled me into secondary. And I’m a fair-skinned, green-eyed blonde! I checked with an attorney friend, and that whole incident was entirely LEGAL. My uncle lives out in Pine Valley, and gets harassed by the Border Patrol constantly. Yep, three separate times you get stopped on the way from Phoenix to here. Get stopped going the other way, too. It’s good thing all of you don’t live in Russia or 95% of the other first world countries on the planet. Rob, why is Russia still your bogeyman? I thought we had other, more up-to-date evil purveyors of power: Iran, North Korea, France, Georgia, Venezuela, and even Mexico itself. First one that popped in my head. Take your pick. Ya know what, the hell with borders and laws. Let’s do w/o both and see how livable this country is in 5-10 years. Rob – don’t blow a gasket, – did you know immigration is actually down in terms of numbers historically, there’s less coming across and there’s less money going south. The border is used like a faucet, it’s turned on when things are good and we need workers, and it’s closed off when times are tough and there’s not enough work. Unreal! I’m a Californian in Huntington Beach. 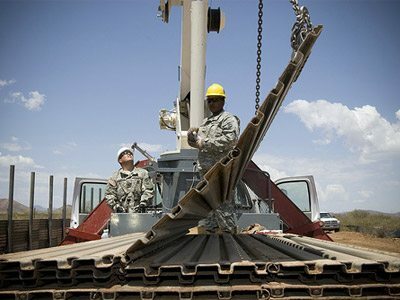 Rather than scrambling to build a Fence along the Arizona border, how about Finishing the fence along our Southern Border. Frankly, it’s a good idea to check any Arizona car for documentation, as many illegal aliens will be scrambling for the leaf blowers in California otherwise. Mel, unreal! You didn’t completely read this post as, frankly, it’s a good idea to check the ending of any article like this. We caught you, dude! This is satire, there is no fence (damn!). One last question: do you know anyone that hires “leaf blowers”, or nannies, or garment workers, or vegetable pickers? Rick, it’s too early to equate unemployment numbers with the recently enacted law, don’t you think? As for economic impact, did you know that Prince William County, Virginia in 2007 enacted a law about the same as Arizona’s 2010 law? Many undocumented workers indeed pulled out of the area — but the county’s economy was devastated by the loss of their labor and their spending. Prince William County soon overturned their law — and they didn’t even have tourism boycotts to deal with, like Arizona does. Have you heard how much Arizona has already lost in convention revenue? Awesome! The only thing better would be two cancelled reservations…call a friend! the law doesn’t even take effect until July. This is the most ridiculous thing that I have ever heard. Such a waste of time and money and energy. Might have been better spent helping build the border fence along the mexican border. Chuck, uh, read the article up to the very end. I think you’ll see or read something that explains it all…. maybe not. If you still have questions, please let me know.